The protein production simulation was produced using the Matrix Laboratory software, MATLAB produced by MathWorks. Specifically this project uses the Simbiology application, which is a collection of computational tools for simulating biological processes. The power of this tool lies in its ability to build multi species and reaction models, then simulate how the species will interact. Figure 1. The proposed path consists of a number of species. The first one identified is "natal peptide" this species represents the initial amount of amino acid chain being produced by the ribosome. It is the "starting" amount of potential protein/misfolded protein/inclusion body present in the system. The second species identified is the "unstable protein" this references proteins that have not reached their fully stable conformations yet or have been destabilized by environmental conditions. Unstable protein has the potential to be degraded by cellular proteases which results in the "degraded protein" species. Additionally unstable proteins have the potential to clump together to form the "inclusion body" species. The inclusion body species is also degraded by proteases so the degraded protein species is also a potential result. 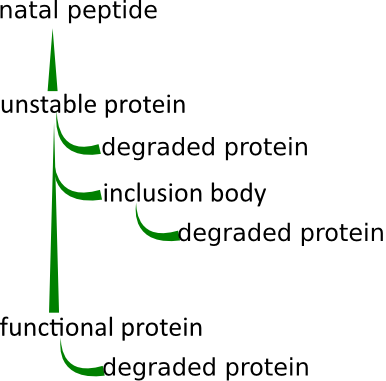 In order to begin investigating the factors that may affect the final state of the natal peptide it first becomes important to define how each of the species in the system interact. This is where the MATLAB software becomes useful. 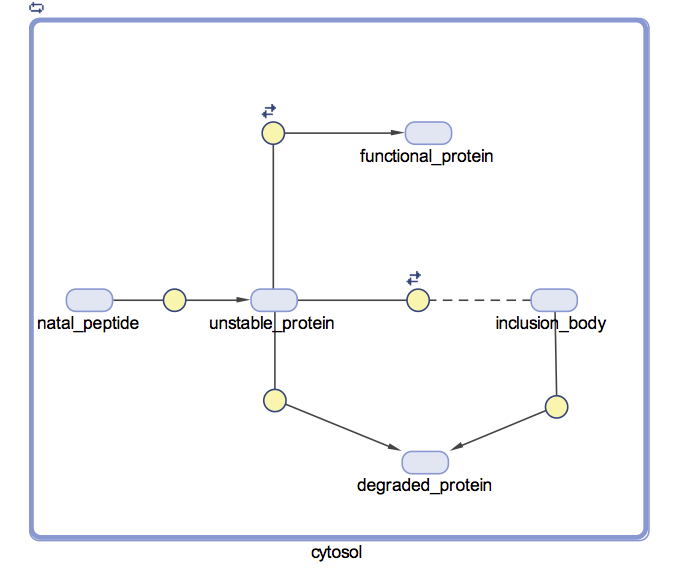 The proposed model pathway can be represented in the MATLAB Simbiology Toolbox. This reaction represents the process of the unstable protein becoming stable functional protein. The reaction is reversible as different environmental conditions, discussed later on, can determine whether or not the protein is in a stable state or unstable state. For the purpose of our model there were two categories of factors that we investigated. These categories are Environmental factors and sequence factors. It is important to note that these divisions are arbitrary and don't necessarily exist in reality. Specifically these categories were created for the convenience of organizing the factors being investigated and determining how to best evaluate their impact. The collection of factors refers to those features of the cells environment that will have an impact on the stability of proteins being produced. When we use the term environment we are referring to both the external temperature at which the cell is growing, the pH of its environment and the concentration of protein within cellular compartments. These factors are not determined by features of the protein being produced but will still affect the likelihood of inclusion body formation and/or protein instability. From this information we have assumed that altering the environmental conditions of temperature, pH and protein concentration will have a quantifiable effect on the rate constants for the above equation. Currently the exact impact of these factors hasn't been determined. The results section only describes rate constants determined for convenience based on qualitative understanding of the processes. For these factors we have tried to look at the features of the mRNA and amino acid sequence that could impact the likelihood of inclusion body formation. As a general rule sequence factors were selected based on how the particular feature affects the time taken for the sequence to reach its fully folded stable confirmation. The reason for this based on the assumption that if the protein has more intermediate stages or is more thermodynamically stable in a non folded confirmation then there is more time for the unstable proteins to interact and begin the formation of inclusion bodies. Sequence features such as scarce amino acids ( Tryptohphan ), mRNA structural features that inhibit translation time through the ribosome and the ratio of hydrophobic amino acids to charged amino acids all have a quantifiable effect on the rate constant at which unstable protein becomes stable protein. This evidence has been indirectly supported from the literature and discussions with researchers in the field. However at this point the precise impact of these factors is still under investigation. As such for the results section, hypothesized relationships alone have been used. The result cases represent the preliminary testing of the model to see if the model simulation can be used to analyze the protein production process under different conditions. The rate constants used for each of the cases were selected for convenience in order to determine if relevant results could be obtained. This means that the rate constants used in the models do not directly correspond to biological data. 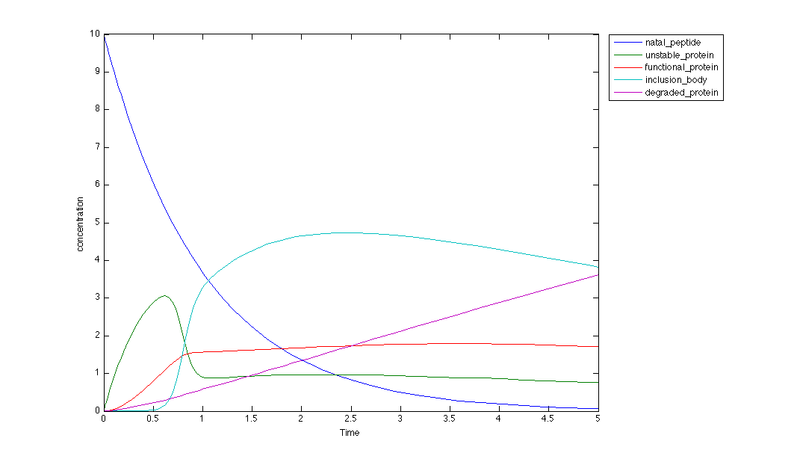 However the relationships between the different rate constants are representative of biological data. It is important to note that this data is very preliminary and only demonstrates that the modelling approach we have taken can be used to investigate the factors affecting protein misfolding. In this case the initial amount of peptide produced is very stable and the equilibrium favours the fast formation of stable correctly folded protein ( red line). Unstable protein is still produced in this scenario, but is quickly degraded by and does not form inclusion bodies. Additionally the unstable protein is not exposing significant hydrophobic amino acids. This also helps prevent the formation of inclusion bodies. There is still a peak in unstable protein, as this species will still be present. But this amount will be degraded quickly. In this scenario the natal peptide is quickly driven towards stable protein. In this case the produced peptide is highly unstable and is composed of significantly more hydrophobic amino acids than charged amino acids. This indicates that in the unstable form a significant amount of the exposed amino acids will be hydrophobic. This state of unstable protein will strongly drive towards inclusion body formation. A high hydropathy value increases the time required for the protein to fold into its correct shape. This means more unstable protein will be present in the equilibrium. The green line on the graph represents this value. 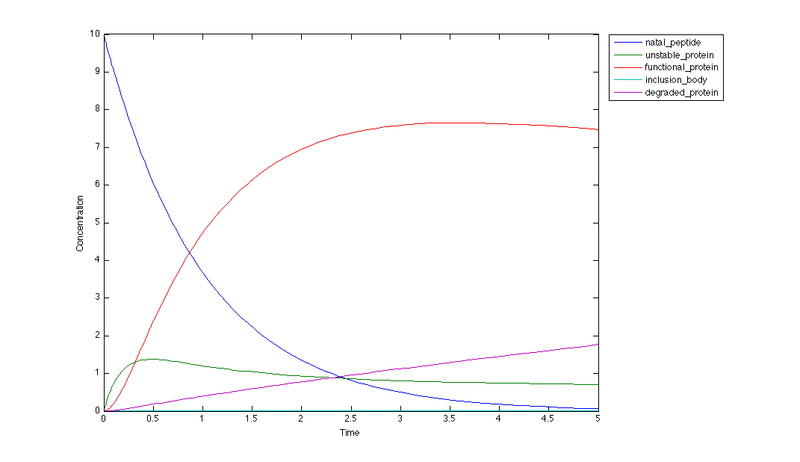 The peak on the graph represents the point of nucleation whereby the concentration of unstable protein reaches a peak that rapidly increases the drive to inclusion bodies. The increased hydropathy content decreases the presence of functional protein. In this scenario the protein is highly stable and drives strongly towards it’s stable functional conformation. However the over production of the peptide means there are high concentrations of unstable protein present, and the higher temperature increases the kinetic movement of the unstable protein. This causes the unstable proteins to collide more frequently and form inclusion bodies before they have a chance to become stable protein. Since the protein is highly stable the nucleation point, the peak of the green line, occurs at a higher concentration and greater time value than that of the unstable protein in the previous case. The highly stable protein produced in this scenario spends very little time in the unstable form. It is quickly converted to stable protein or driven into an inclusion body. In this scenario the concentration and temperature causes the equilibrium to favor inclusion bodies over the functional protein. In this scenario the functional protein is very stable and favored. However the concentration of unstable intermediate causes the intermediate proteins to be caught up in inclusion bodies prior to formation of correctly folded protein. 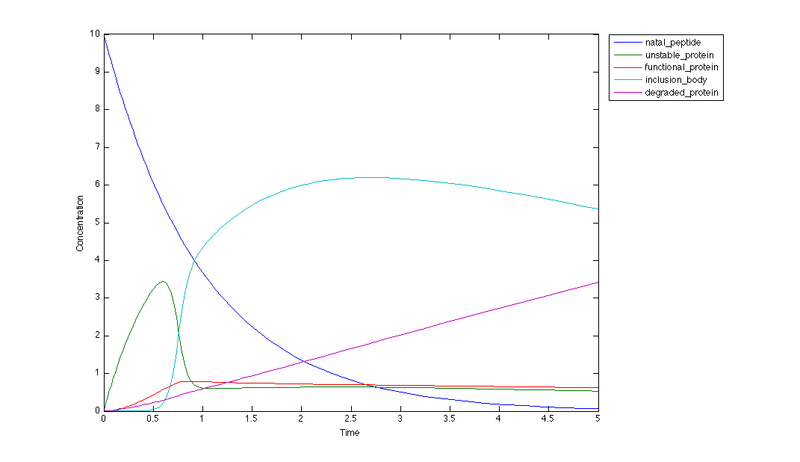 The concentration of inclusion body increases rapidly when the concentration of unstable protein reaches the point of nucleation ( peak of the green line ). This point is reached more slowly than in the previous scenario as the protein is more stable, and a certain concentration must be met before nucleation occurs. There are a number of immediate problems with this model approach that affect the accuracy of the results. The first and most significant is that the values for the amounts of species and the kinetic constants were selected for convenience. This means they were selected such that their relative relationships would allow us to determine if the model could be made to match the behaviour seen in the literature. As a result the the outputs of the simulation can not be taken as "real" because they do not use true values. The second major issue is the equilibrium equations proposed for each of the reactions are abstractions and may not be the best ways of relating the species. The third major issue is that there aren't any clearly defined relationships between each of the factors being investigated and misfiling. Therefore the relationship between factors such as temperature and sequence features such as hydrophobic/charged amino acids are accounted for in a qualitative way only. Accounting for these caveats this model was still a success in a number of ways. The results demonstrate that the MATLAB Simbiology software can be used to simulate the process of inclusion body formation. The graphs obtained match closely, albeit in a qualitative way, the process of inclusion body formation as it is described in the literature. Lastly, this approach has provided us with a framework that can be used to study the factors affecting protein misfolding and aggregation. The most necessary future direction is to find a "test" protein and apply the principles of the model to determine if the simulation results match with literature results. If this can be shown more test proteins can be evaluated with the model and the model can be made more general. The second future direction is to explore the concept of "cut off" values. From the equilibrium graphs in the results section it is clear that there is some amount of inclusion body present, some amount of unstable protein and some amount of stable functional protein. This implies that there will always be a ratio between the three different species and also that even when inclusion body is present some functional protein will be too. A cut off value would be the ratio of functional protein to non functional such that functional protein can still be obtained. The final future direction is to develop a way to account for the four different categories of inclusion bodies that are seen in the literature values. Ashbaugh, H. S., & Hatch, H. W. (2008). Natively unfolded protein stability as a coil-to-globule transition in charge/hydropathy space. Journal of the American Chemical Society, 130(29), 9536-9542. Roberts, C. J. (2007). Non-native protein aggregation kinetics. Biotechnology and Bioengineering, 98(5), 927-938. Wang, W., Nema, S., & Teagarden, D. (2010). Protein aggregation--pathways and influencing factors. International Journal of Pharmaceutics, 390(2), 89-99.